Two of the masterminds behind Weedmaps – perhaps the most successful online advertising platform for cannabis businesses – are working to set up a new company that would be directly involved in California’s marijuana supply chain. 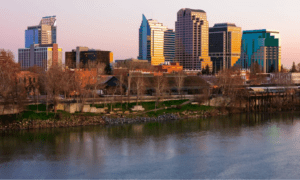 The venture recently moved a step closer to fruition when the proposed business received conditional approval for a distribution facility in West Sacramento, even as those same executives remain embroiled in a conflict with California marijuana regulators. Weedmaps CEO Doug Francis, President Chris Beals and Chief Operating Officer Steven Jung would spearhead the new company, DICA Distribution, according to a business proposal obtained from the West Sacramento planning commission. DICA would be a standard California distributor, acting as an intermediary between the production side of the industry and retailers. The move to get DICA a distribution permit comes at a time when it’s still unclear how its executives – in particular, Francis and Beals – stand with the state because Weedmaps continues to accept advertising from unlicensed marijuana businesses in violation of regulators’ orders. The situation also highlights the fractured nature of California’s newly regulated cannabis industry. Weedmaps has become a flashpoint for many licensed operators that have spent enormous amounts of money to comply with costly regulations, only to watch as the online platform advertises retailers that are technically illegal and undercutting the licit market by not paying taxes. The DICA Distribution facility also still must be formally approved by the West Sacramento City Council before it can apply for a state permit or begin operations. However, Francis has been laying the groundwork for DICA since at least October, when he registered the company as a limited liability corporation in Delaware. Neither Francis nor Beals could be reached for comment about their plans regarding DICA. The Weedmaps executives’ bid to enter California’s plant-touching sector through DICA is already drawing fire from some industry insiders. Jerred Kiloh, who owns The Higher Path dispensary in Los Angeles, said Francis and Beals are attempting to “have it both ways” by profiting from unlicensed retailers advertising with Weedmaps while also trying to start a new company in the fully regulated market. “If they’re going to be a part of the supply chain and enter the legal market, do it with both feet. Don’t have one foot in the illegal or unregulated market and one in the regulated market. It really just shows bad faith,” said Kiloh, who also serves as president of the United Cannabis Business Association, a group of L.A. dispensaries. The California Bureau of Cannabis Control (BCC) sent Weedmaps a cease-and-desist letter in February, threatening the company with “criminal and administrative penalties” if it didn’t stop advertising unlicensed marijuana businesses. It’s unclear what penalties Weedmaps may face. Sacramento regulators also sent Weedmaps a cease-and-desist letter regarding its advertising of unlicensed cannabis companies within city limits. Sacramento and West Sacramento, where DICA is hoping to do business, are autonomous municipalities. Francis and Beals have yet to comply with the state’s letter, arguing that the bureau doesn’t have any legal power over Weedmaps because the business doesn’t hold a license issued by the BCC. The conflict between Weedmaps and the bureau remains unresolved. BCC spokesman Alex Traverso wrote in an email to MJBizDaily that there is “no further news at this time” regarding the cease-and-desist letter. So, it’s still unclear whether the agency will even try to pursue further action against Weedmaps. Kiloh suggested that California regulators should consider Weedmaps’ refusal to conform with the BCC’s order in weighing DICA’s expected request for a state distribution license. L.A.-based cannabis consultant Avis Bulbulyan said that if DICA does get to that step, the Weedmaps conflict shouldn’t be an issue because the proposed distribution company is a separate business entity from the online platform. “It’s apples and oranges,” Bulbulyan said. “Because the common denominator are the principals of both of those companies, it does create a contradictory situation. He added that if the bureau were to deny DICA a permit because of its conflict with Weedmaps, the distribution company would arguably have legal recourse to sue the state for unjustly denying it a license. However, he added, the bureau could launch a formal investigation into possible legal violations by Francis and Beals, as opposed to violations by Weedmaps. Such a move could give the BCC cover if it wanted to deny DICA a distribution permit, he said. Bulbulyan acknowledged that many in the California cannabis industry harbor “big-time resentment” toward Weedmaps. But that probably doesn’t matter much to the company or its clients because there aren’t many other viable marketing options for cannabis companies. “If you leave it up to the industry, nine out of 10 of them will probably say something negative about Weedmaps,” Bulbulyan said. “In reality, nine out of 10 are still paying Weedmaps to advertise and market for them. Weedmaps is the Backpage.com of cannabis. Backpage.com principals maintained the same argument that they “weren’t but a platform” and were not responsible for criminal commerce on their “platform”. Until they pled guilty and now will serve jail time. Can’t have it both ways, guys. If DICA goes through, the Weedmaps owners would just post retailers on their site that purchase wholesale cannabis from their distribution, i.e. be making money on two points of distribution. Weedmaps is the go to, word of mouth, standard for consumers. The regulators are doing it wrong. The regulators should just use Weedmaps to find unlicensed actors in the industry and force compliance with the law – Weedmaps is doing part of the work for them. Weedmaps is trying to create a monopoly throughout the state. Get the Lion’s Share of permits for cannabis activities. In Kern County they paid a $25,000 bribe to a supervisor and caused the local dispensaries to be raided so that they could take over all the retail, distribution, and cultivation activities.